Space battles are always awesome and when there’s Ben 10 involved, it goes to the next level. 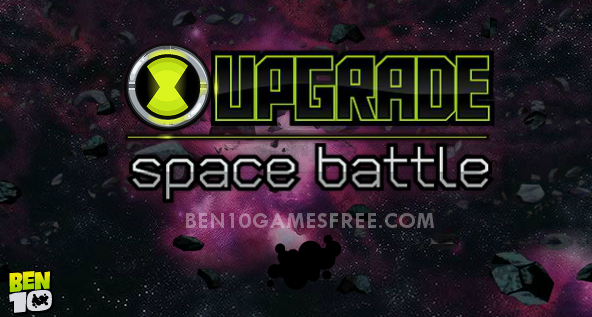 Here is our new game – Ben 10 Upgrade Space Battle. Ben must stop Vilgax from reaching the creator of Omnitrix. Because, if it happens Ben will lose all his powers. Help Ben to save the day! This Ben 10 space game is based on the animated cartoon series Ben 10 Omniverse. From the outer space, Vilgax has started his search for the creator of Omnitrix. Before he finds it and destroys it, Tetrax decides to warn Ben about the upcoming storm. Ben transforms into Upgrade and fights the space robots and ships sent by Vilgax to destroy Omnitrix. Recommended: Play Ben 10 Omniverse Games online now for free! Ben 10 Upgrade Space Battle game features only one Ben 10 alien i.e. Upgrade and there are a number of powerful airships attacking you. To complete each level, you must use the superpower of Upgrade to capture the enemy airships and destroy other aliens using it. Remember you can only possess a particular airship or flying robot for a limited period of time after which it will be abandoned. The more powerful airship you possess, the more powerful your attacks will be, so you must keep this in mind. Pro Tip: Destroy enemies one after the other to earn combos and safety shields. At the end of each level, you have to defeat a boss ship. And in the very last level, you must defeat the Vilgax Airship to win Ben 10 Upgrade Space battle game. Help Upgrade to stop Vilgax from reaching the creator of Omnitrix and Win. Good Luck!! Don’t Forget to give your rating for Ben 10 Upgrade Space Battle game and share your tips and tricks to win this game in the comments section below.